An initial examination of the whale by Dr. Stephen Raverty, a marine mammal veterinarian, suggested that the animal became injured and eventually died from blunt-force trauma. See the news release by Canada’s Department of Fisheries and Oceans. For some whales, this type of injury is often associated with being hit by a boat, but orcas are fairly nimble creatures normally able to avoid boats with ease — unless something else is going on. It will be interesting to read the full necropsy report, including X-ray images of the skull, to see whether anything more can be gleaned about the shape of the object that struck J-34 in the head, said Ken Balcomb of the Center for Whale Research. Ken agreed that a boat collision seems unlikely, but he struggled to come up with any probable scenarios. Possibilities, as unlikely as they seem, include a collision with a barge being towed by a tugboat, since the barge would be relatively quiet compared to the boat. Could the whale have been hit by something moving under the water, such as a torpedo? Since J-34 was known for breaching, perhaps he flung himself out of the water and came down on a floating log. So far, nothing really seems to make sense. So we end the year mourning the death of the sixth Southern Resident to die this year and no cause for celebration. The population of the three orca pods now stands at 79 — one less than the population in 1977, following another baby boom that produced nine new offspring. Killer whale captures were banned in Washington State in 1976, after about 50 whales were taken from Puget Sound and shipped to aquariums around the world, according to NOAA’s 10-year report on Southern Residents (PDF 24.2 mb). Kitsap Sun reporter Tristan Baurick recently reported on Puget Sound’s first captive orca, Namu, some 50 years ago. The population of the Southern Residents has never recovered since the capture period, although it has gone through periods of boom and bust, according to Ken Balcomb’s well-kept census of the whales beginning in 1976. From 71 orcas in 1976, the population grew to 84 in 1980, according to the census, which takes its count on July 1. Four years later, the number had dropped back down to 74. The next period was a fairly steady climb for a dozen years, with the population reaching a peak of 98 in 1995. Then came a fairly steady decline for six years, returning to 80 animals in 2001. Every gain has been accompanied by a loss, every loss by a gain. Low points came in 1984 with 74 whales, 2001 with 80 and 2014 with 78. Down years include 2008 and 2012, when eight whales died each year; 2000 and 2010, when seven whales died each year; and 1998, 2006 and 2016, when six whales died each year. Looking back on the history of this population, I couldn’t help but wonder if the viability — chance of long-term survival — is any better today than in 1977. The average period between births has increased from about 9 years in the 1970s to 9.6 years today. That means females are not producing as many offspring as in years past. Worse, some females of reproductive age don’t seem to be producing any viable offspring at all. The main problem holding the population in check appears to be a limited supply of chinook salmon, the primary prey for Southern Residents. Several studies have shown a direct relationship between orcas and chinook runs in the Northwest. When chinook runs are low, orca mortality is high. Although the relationship is not quite as direct, it also appears that good years for salmon can lead to increased births among whales, perhaps with some lag time. I explored some of these issues in a piece I wrote for the Encyclopedia of Puget Sound last July. With no apparent improvement in conditions, the whales remain on an uncertain trajectory toward extinction. A sudden decline in numbers caused by an infectious disease or a catastrophic oil spill could take the numbers down to a critical level, where inbreeding becomes a much greater problem for the population. 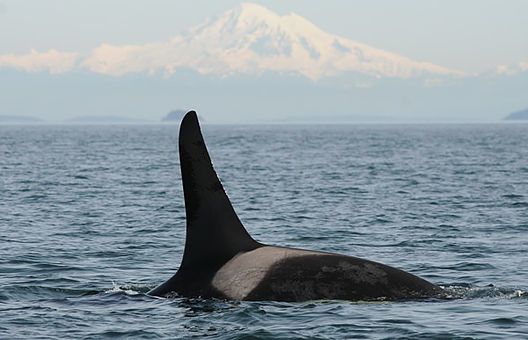 It is interesting to note the difference between the Southern Residents of the Salish Sea and a similar group of fish-eating orcas called Northern Residents, which frequent northern British Columbia. The population of Northern Residents has been steadily increasing since the 1970s with two minor downturns. After the capture period, when at least 14 Northern Residents were put into aquariums, the population went from about 120 whales in 1975 to nearly 300 today. One reason may be access to fish. Chinook salmon originating in the Columbia River, along the West Coast and in Puget Sound grow to adult size in the ocean and return through Southeast Alaska and British Columbia. That gives the Northern Residents the first chance to catch the salmon, with Southern Residents farther down the line. Another factor, Ken told me, is that Northern Residents appear to be eating more black cod (sablefish), including some taken right off the lines of fishermen. This opportunistic approach may help the whales withstand downturns in salmon runs — although the whales’ actions are quite frustrating for commercial longliners. Ken said he is working on a report looking at changes in population structure of the Southern Residents. Meanwhile, NOAA’s Northwest Fisheries Science Center will soon release its five-year update on the status of the Southern Residents, which are listed as endangered under the Endangered Species Act. The status update will include a population viability analysis describing the extinction risk. J-55, whose mother was never confirmed, died within a month of birth. Water Ways, Feb. 27. L-95, a 20-year-old named Nigel, was found dead floating off Vancouver Island in April. Later, experts linked the death to a fungal infection that may have been introduced when the whale was “tagged” for research purposes. Water Ways, April 14, along with Water Ways, Oct. 5. J-14, a 42-year-old female named Samish, went missing during the summer. Water Ways, Aug. 24. J-28, a 23-year-old orca mom named Polaris, was first reported as “super-gaunt” and later turned up missing from her pod. Water Ways, Aug. 24, along with Water Ways, Oct. 30. J-54, Polaris’ 11-month-old son named Dipper, died soon after his mother was no longer around to support him. Water Ways, Oct. 30. J-34, an 18-year-old male named DoubleStuf, was found floating near Sechelt, B.C., northwest of Vancouver, on Dec. 20. See above for details and links to other information.